Imagine: you’re sitting in a mall food court, eating your orange chicken, when a song begins. One by one, people sitting at tables next to you get up and start dancing. 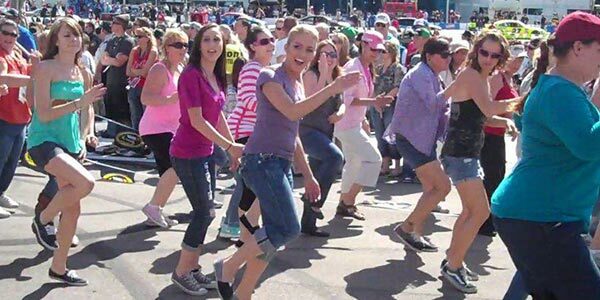 The classic flash mob strikes again! Now, imagine how much planning must have gone into organizing that chorus of dancing people. At Flash Mob Las Vegas, founder Denise Lahav has turned the viral art of (planned) spontaneous dancing into a successful business. Packed with offerings such as Splash Mobs, corporate events and marriage proposals, Lahav — who is also a producer and choreographer for the organization — needed a site that was both easy to use and robust to coordinate and train her dancers. After learning about SignUpGenius from another flash mob organizer, she decided to try it herself. Since then, Lahav says she can’t live without it. Lahav says Flash Mob Las Vegas also benefits from improved communication provided through custom reminders and notifications. SignUpGenius empowers people to change the world by making it simple to organize groups. We’re proud to help Flash Mob Las Vegas continue its mission in style!